ABS-CBN Seeks Health Advice From A Tarot Reader For Their Medical Television Program "Salamat Dok"
One of the things about Philippine media that is deeply saddening is the prevalence of pseudoscience being pushed down people's throats. The writers and journalists manning the country's newspapers, radio stations, and television stations are very lazy when it comes to policing the superstitious stuff that they put out there for public consumption. A perfect example of the Philippine media's incompetence when it comes to dealing with the superstitious is the claimed demonic possession of over a dozen students in Cebu last November. News outlets in the country feasted on the story with headlines such as 14 Students Possessed (Philippine Star), 'Demonic Possessions' Result In Cancellation Of Classes (Sun Star), and Exorcism In Cebu After Students 'Possessed' By White Lady (ABS-CBN News). Notice how overly enthusiastic these new sources were in putting the words "possession" and "possessed" in their reports. Dave Tumulak, a councilor and chairperson of the Cebu City Disaster Risk Reduction and Management Council reviewed the incident and made the suggestion that it's a case of mass hysteria. This is the most logical explanation to what transpired. However, you don't see the phrase "mass hysteria" in the media reports. What's worse, superstition is also rampant in Philippine television. It's fine if they are part of fiction programs or paranormal-based shows. But it's outright wrong to find them being pushed in medical shows like what just transpired on Salamat Dok, a long-running medical television program on ABS-CBN. You would think that since the show's goal is to teach people how to stay healthy, they'd be showing stuff that are science-based. This is not the case. 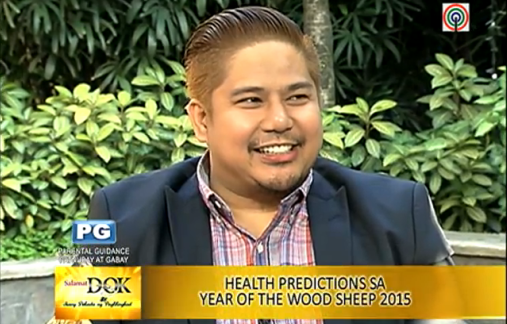 In a recent segment of Salamat Dok, they brought a certain Master Hanz Cua to teach their viewers some health lessons. Cua doesn't work in the field of health or medicine. His website says he practices feng shui, astrology, chakra meditation, tarot reading, and face reading. Screengrab from ABS-CBN's show Salamat Dok. The obvious question here is why is a tarot reader giving health advice in a medical show called Salamat Dok? They should change their program's title to Salamat Tarot Reader. There are people who would read this article and probably say it's just for fun and we should not think too much about it. No. This man is out of place. Let real doctors give advice in Salamat Dok. Cua can give his in shows that deal with his tarot stuff. Getting a tarot reader to give health advice in a medical program is like inviting a creationist to explain evolution in a science program. You can watch the segment featuring Cua here. It runs for nearly eight minutes and he talks about your health being affected by your birth time and birth date, health stars, problematic illness stars, ...... basically things that don't belong in a medical show.